Industrie 4.0 is far more than a term that is simply ‘trending’ in the manufacturing industry, it’s a tool made up of many component parts which are able to offer genuine benefits and competitive gain to plants prepared to think progressively about the digital future. Take smart sensors, for example. When optimally selected and applied, the latest smart sensor technologies for fluid-power applications can have a positive impact on strategies such as predictive maintenance. Real-time data collection (via smart sensors), as part of Industrie 4.0, can influence decisions about scheduling downtime to carry out maintenance operations. These decisions can prove advantageous in terms of maximising productivity and meeting ever-shortening customer delivery schedules. Maintenance operations vary from plant to plant, but are traditionally based on reactive or preventative strategies. With the former, lost production and unforeseen costs are the typical outcome, while the latter often sees systems or parts repaired, not because they need it, but simply because they are listed on the general maintenance procedures, again incurring unnecessary expense. With these facts in mind, attention has been gradually shifting to predictive maintenance as a potential industry game-changer, spurred on to a large degree by the emergence of Industrie 4.0. For many years, it has been possible to monitor motion control equipment on machines. In fluid-power systems (pneumatic, electro-pneumatic, hydraulic, electro-hydraulic) that process has normally revolved around factors such as the position of the actuator and whether the gate is open or closed. Now, however, things are moving to a whole new level of condition monitoring, to the extent that maintenance personnel can determine whether something out of the ordinary has occurred. The latest sensor technologies available for fluid-power systems are somewhat different from their counterparts of yesteryear. For instance, traditional solenoid valves operated by simple contactors in an output card are today being replaced by network-enabled devices with built-in diagnostic sensing to monitor temperature, voltage, current and even cycle counts, which can be useful for warranty claims. The high quantity of data these sensors produce creates an equally sizeable opportunity to transform the way plant managers operate and maintain industrial equipment. This is especially true in light of the increasing momentum associated with Industrie 4.0 manufacturing strategies. 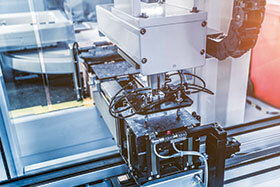 Embedded smart sensors can today be integrated with numerous different low-level fluid power products, from connectors, hoses and tubing, to pumps, motors, actuators and filters – all as part of an Industrie 4.0 installation. One of the principal opportunities arising from this concept relates to predictive maintenance. For example, some of the diagnostic data generated from control valves could be invaluable in troubleshooting power issues. Among the common concerns in fluid-power systems are voltage sags that can occur downstream on long runs, which sometimes lead to misfiring valves. Normally, without an oscilloscope, there is no means of diagnosing the root cause of the problem. In contrast, if each valve manifold node included voltage sensing, a ‘sweeper’ program could be written to record voltage levels across the machine during certain periods of the cycle. Smart sensor technology also has the ability to help predict hydraulic hose or connector leakage. With vibration sensors embedded at the right locations on a hose or connector, and the tools to communicate that data back to a monitoring system, a simple program can be written to conduct and record a straightforward trend analysis with the ability to predict if a hydraulic leak is likely to occur. A similar strategy could be employed for detecting leaking piston seals in a hydraulic actuator. Using a correctly specified embedded temperature sensor, a cylinder would be able to alert maintenance personnel to any unexpected temperature differentials, which might indicate bypassing of the piston seal. Of course, selecting an Industrie 4.0-enabled sensor is one thing, but ensuring that it can communicate with other such devices is quite another. For this reason, it is imperative to select a sensor vendor that operates a centralised strategy to ensure that its smart devices and subsystems share open communications standards and best practices. IOLink is the first I/O technology for communicating with sensors and actuators to be adopted as an international standard (IEC 61131-9). This open protocol is bringing the world of Industrie 4.0 to component level, and already proving essential in ensuring interoperability across multiple technologies and manufacturers. Smart sensors and other Industrie 4.0-enabled devices must work in co-operation with products from other manufacturers. In fact, the value of any connected digital solution is directly proportional to its interoperability. There is no place for proprietary solutions; an open, exchange-based architecture that enables interoperability with third-party products, applications and platforms is essential. Talk about Industrie 4.0 and one recurring area of concern arises: security. Indeed, this issue has been central in discouraging many plants from taking the decision to connect machines and devices to the cloud, and gaining the insight required to predict failures and optimise performance at component level. For any company concerned about this issue and seeking guidance on how to move forward this is the point where choosing the right vendor becomes crucial. It is essential to choose suppliers who can share technical knowledge and hands-on experience gained from working across a wide range of advanced applications. With specific focus on fluid-power installations, the selected vendor should be able to offer advice on where sensors need to be integrated to obtain optimal insight, the type of data to collect, and how to present the results to MRO (maintenance, repair and operations) personnel in the way that is most useful. Progressive, forward-thinking vendors are striving to bake in best-practice data encryption in motion and storage to create secure end-to-end Industrie 4.0-enabled systems. Using the latest sensor intelligence is now about far more than simply monitoring factors such as position and speed. It’s about using data, collected in real time, to provide vital information concerning service life that can help facilitate the implementation of predictive maintenance. This data can be used to identify when a machine or system is not functioning correctly, or at its optimum efficiency. Early sensor notification of issues allows system operators to investigate, consider, plan and schedule the required corrective maintenance for a time when production throughput is either low or can be stopped. This could be overnight, during a larger planned plant maintenance shutdown, or whenever there is least impact to those all-important customer delivery schedules. A recent study by Accenture and GE found that predictive maintenance can generate a 30% reduction in maintenance costs and an up to 70% cut in production downtime caused by equipment breakdowns. Clearly, the value that the latest smart sensors can add to the implementation of predictive maintenance strategies as part of an Industrie 4.0 environment should not be underestimated.